These are the perfect excuse to get rid of some of your cocoa stash. I am I getting my kitchen back together, and discovering that I am a hoarder of some things. I don’t buy many canned vegetables, but I have about 20 cans of green beans. I also have a whole shelf of tomato products (infinitely useful) and, even though I rarely eat it, about 10 boxes of Kraft Mac and Cheese. I’m a sucker for the character varieties. It’s a guilty pleasure. 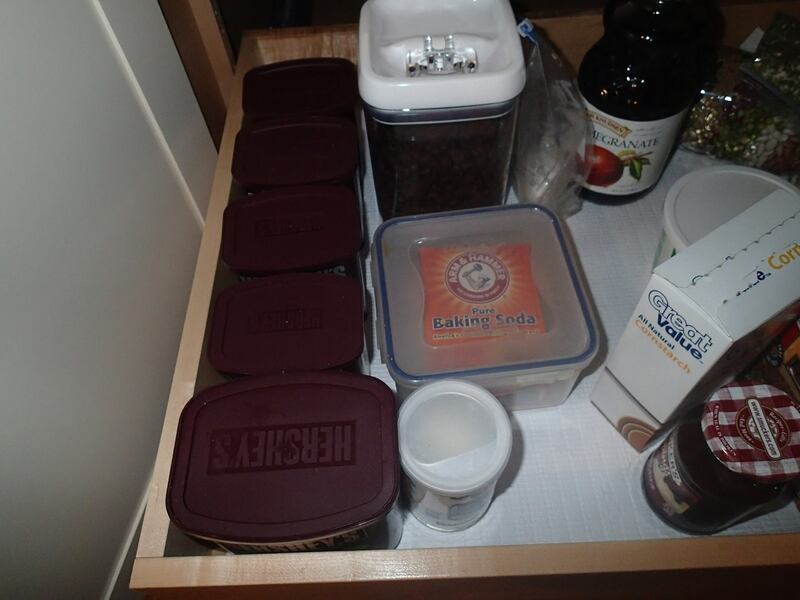 When I started organizing my baking shelf, I noticed how many tins of Hershey’s cocoa powder I have. I think I have so many because my old baking cubby was a lazy Susan corner cabinet, and it never spun properly. I never knew if I had cocoa or not, so i just bought it whenever I needed to use it. Many of these, including the large one, are unopened, which is weird. I wonder why I bought that big one. I must have had plans for it. How many cocoas does one person need? 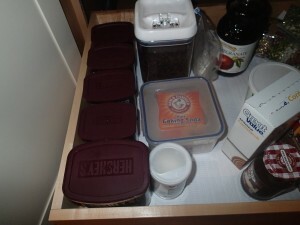 All these, except one container, are regular, unsweetened cocoa. Several friends of mine commented that their cocoas multiply too. Hershey’s has inspired a whole generation of cocoa hoarders. I have a bake sale to bake for this weekend, so I decided to make use of all this cocoa. 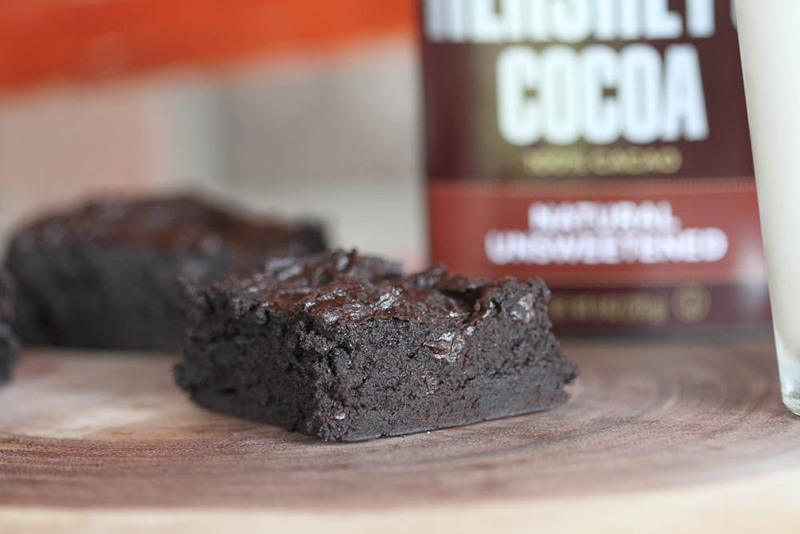 Everyone knows the best use ever for cocoa powder is brownies, and brownies are a big seller. They travel well. They’re not messy to eat on the run, and they’re so good. 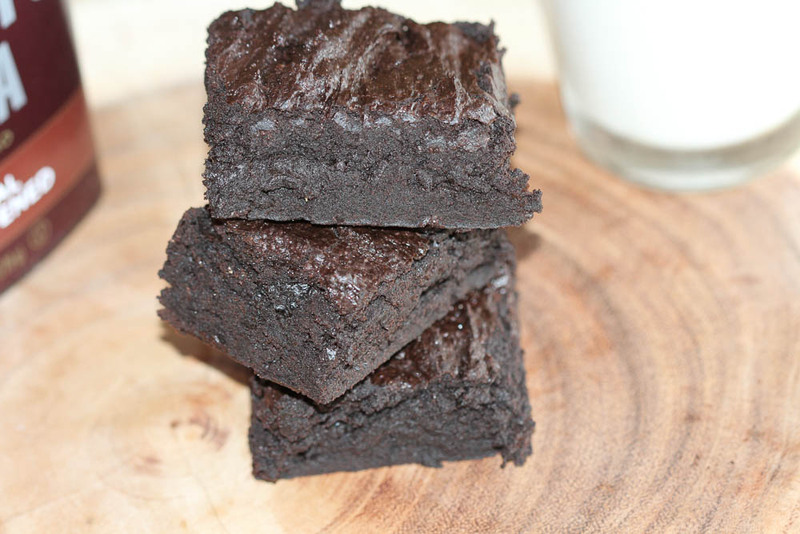 I have an old recipe that makes fudgy, decadent brownies and it’s easy. The original recipe calls for heating things over a double boiler (I think it came from a time before microwaves), but I cut out some of the steps to make them a lot easier. 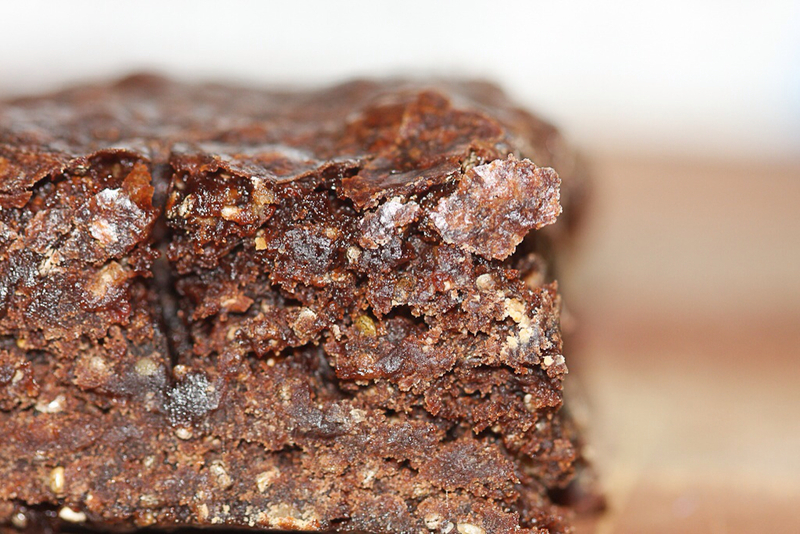 This easy recipe makes a great brownie dry mix and is the perfect excuse to use up your cocoa stash. Prepare a 8 by 8 pan with either parchment paper, butter or non-stick spray. 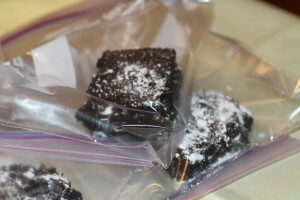 I prefer to use parchment because the brownies come out cleaner, but a good greasing works too. 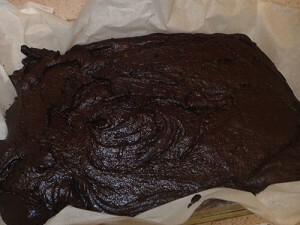 If you use parchment, let some "handles" hang over both sides so you can just take all the brownies out at the end for cutting. 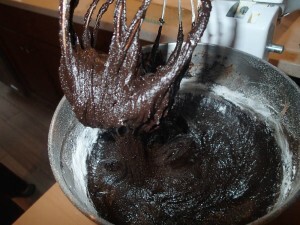 Combine cocoa powder, melted butter, vanilla and sugar. Stir in eggs until well blended. Batter should be shiny. Spread evenly in pan. This batter is very thick and doesn't rise (notice, no real leaveners). It's supposed to be. Make sure to smooth out the top as best as you can because what you see is what the final product will look like. Bake for 20-25 or until a toothpick comes out almost clean. There will still be a little batter on the toothpick, because these are fudgy. I like to watch the edges. When they start to dry, they are probably ready. Cool and cut into 12 even squares. You can sprinkle with powdered sugar if you want, or serve with ice cream. I recommend just eating them. If you want to make a brownie mix (for gift giving or to have for quick brownies), mix the sugar, cocoa powder, flour, salt and chocolate chips together. Leave instructions to add the wet ingredients. This mix would look nice layered in a mason jar. This is what I mean by “handles.” The overhanging parchment can be used to lift the square of brownies out for nice, even cutting. This batter is so thick, it sticks to my mixer. You can store the dry ingredients as a DIY brownie mix, for whenever you get a brownie craving or to give away. Just put the dry ingredients in a sealed container, like a mason jar. You could even layer them to make it look pretty. Send a card with the amounts of wet ingredients you need and instructions. Plain packaging, but they still look yum. I normally package goods for bake sales nicer than I did these. People buy with their eyes. I couldn’t find my ribbon or fancy bags, so these will have to do in ziplock bags. I did cover them in powdered sugar. These are so rich and heavenly, I think people will buy them, packaged or not. 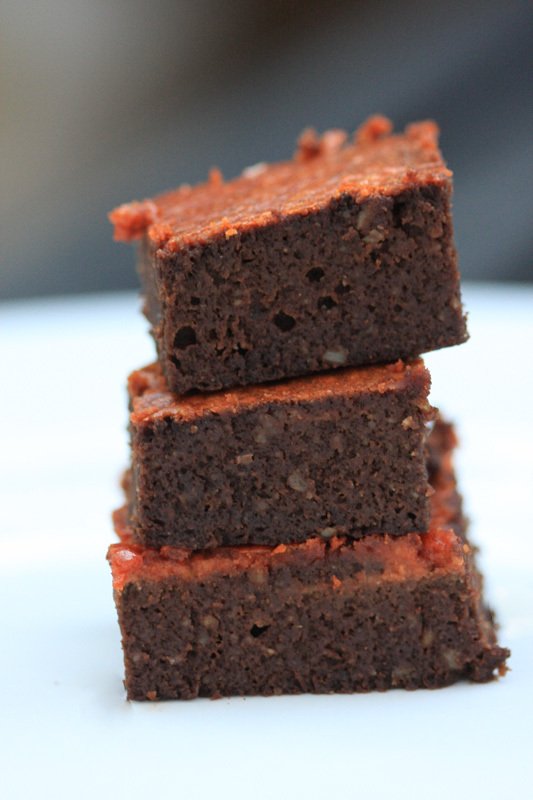 And just for the heck of it, stacked brownies. It’s always nice to stack baked good for photos. I could easily eat this whole stack. I think this trend of stacking food is kind of hilarious. You’ve Got Peanut Butter in My Chocolate: Low Carb, Gluten Free Reese’s Brownies Chi-Chi-Chi Chia Brownies Refrigerated Cookie Dough and Twine Mode Overload: What Do All These Oven Modes Mean?